The taxanes are a relatively new group of plant-derived chemotherapeutic agents that have been studied quite extensively in both preclinical studies and in clinical trials. This group of drugs, which includes paclitaxel (Taxol) and docetaxel (Taxotere), act as mitotic spindle inhibitors through their promotion of microtubule assembly and retardation of disaggregation. Paclitaxel is a natural product derived from the bark of the Pacific yew (Taxus brevifolia) whereas taxotere is a semisynthetic analog prepared from the needles of the European yew (Taxus baccata) (1). The taxanes as a group have had significant success in the treatment of solid tumors in the setting of both metastatic disease and adjuvant therapy as well as in locally advanced disease where they are combined with radiation in either a sequential or concurrent fashion. There are also several newer taxanes/microtubule inhibitors that are under development that appear to have promising activities in the completed preclinical studies. They include taxoltere metro (2), the epothilones (3), and the BMS compounds 184476 and 188797 (4). 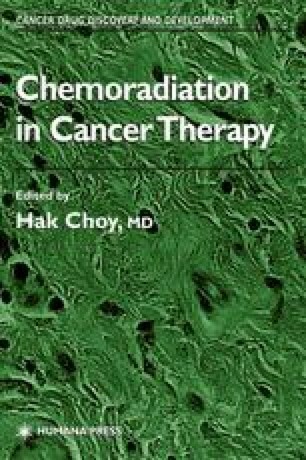 This chapter will provide an overview of the current status of the taxanes and their combination with radiation in the treatment of human malignancy through a review of the preclinical literature on the subject. It will then focus on the status of clinical practice with a look into the future and the place of taxanes at the start of the new millennium.